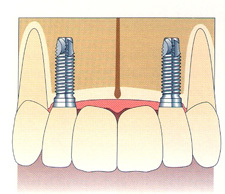 If you are missing one tooth, you may be a candidate for a single dental implant. A dental implant is a titanium metal post that, with a crown, replaces the missing tooth; it even looks and feels like a natural tooth. When a missing tooth is replaced with a bridge, it is necessary to grind down the nearby teeth in order to support the bridge. 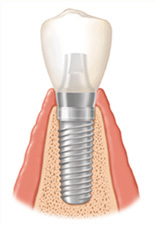 A dental implant, on the other hand, does not affect the adjacent teeth, because it fuses with the bone and becomes an anchor for a crown (cap). A single tooth implant takes the place of your tooth root and acts like a natural tooth. 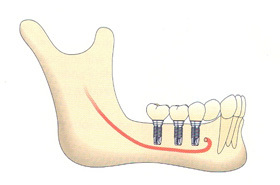 This means that the bone will stay intact and not deteriorate as it would under a bridge. A single implant can also be easier to keep clean than a bridge, and it’s less likely that your gums will recede from an implant. If you are in good general and oral health, and if your gum tissue is healthy, with adequate bone to support a dental implant, you could have a new tooth before you know it! Depending on how long the tooth has been missing, some additional procedures may be necessary, so talk to Dr. Dalessandro to get a treatment plan for your unique needs. 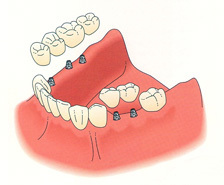 The common treatment for multiple missing teeth is bridgework or dentures. This requires grinding down healthy teeth to use as support. However, there is another option: dental implants. A dental implant is a titanium metal post that fuses into the bone to replace your tooth root and can be used to support a bridge, instead of harming your healthy teeth. If you are missing multiple teeth on one side of your mouth, multiple dental implants can be placed in a row. These implants can support multiple individual crowns, tied together to support a bridge, or used to support dentures. Once the implants are in place, they can be used in many ways. 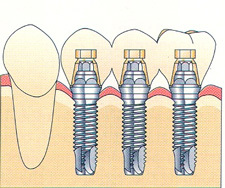 If the type of restoration changes down the road, the existing implants can be used as support for the new restoration. Because an implant fuses with the bone, the bone will stay intact and not deteriorate as it would under bridgework or dentures. Depending on how long your teeth have been missing, some additional procedures may be necessary before implants are placed, such as bone grafting. Talk to Dr. Dalessandro to get a treatment plan for your unique needs. If you are in good general and oral health, with adequate bone support, you could be a candidate for multiple tooth implants!